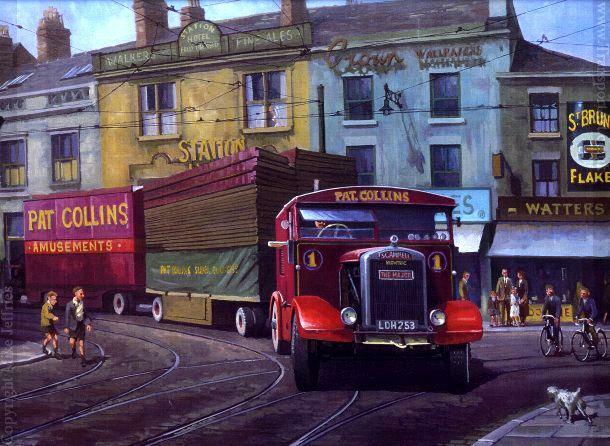 Aviation and Transport Art "Scammell Shotrac 1948"
The Scammell Shotrac was manufactured specifically for showmen as a generating unit and haulage tractor and was powered by the trusty Gardner 6LW with a similar unit on the back to generate electricity for the fairground rides. Only a handful of Scammell Showtracs were made specifically for towing fairground and circus trailers and as a generator for the rides and lighting, and due to their battleship type construction nearly all have survived into preservation. This smart example of Pat Collins is seen treading its way though a typical townscape in the 1960s with its attendant posse of excited urchins.